Abrasion is the loss of tooth structure by mechanical forces from a foreign element. If this force begins at the cementoenamel junction, then progression of tooth loss can be rapid since enamel is very thin in this region of the tooth. Once past the enamel, abrasion quickly destroys the softer dentin and cementum structures. Possible sources of this wearing of tooth are toothbrushes, toothpicks, floss, and any dental appliance frequently set in and removed from the mouth. The appearance is commonly described as V-shaped when caused by excessive pressure during tooth brushing. The most common cause of attrition is bruxism. Functional habits are those such as chewing and swallowing, which usually puts very little force on opposing teeth. Parafunctional habits, such as clenching and clicking the teeth together nervously, place greater amounts of forces on opposing teeth and begin to wear the teeth. 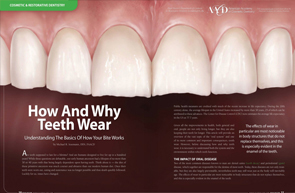 As expected, wear usually begins on the incisal or occlusal surfaces. Characteristic Features: Development of a facet (flat surface with circumscribed and well defined border). Opposing tooth facets will match perfectly in occlusion. Interproximal Attrition: Occurs at proximal surfaces of adjacent teeth when they move against one another on occlusal loading. Movement of teeth is in the vertical direction. Abfraction is the loss of tooth structure from flexural forces. This has not been supported yet by dental research but it is hypothesized that enamel, especially at the cementoenamel junction (CEJ), undergo this pattern of destruction by separating the enamel rods. As teeth flex under pressure, the arrangement of teeth touching each other, known as occlusion, causes tension on one side of the tooth and compression on the other side of the tooth. This is believed to cause V-shaped depressions on the side under tension and C-shaped depressions on the side under compression. Acid erosion, also known as dental erosion, is the irreversible loss of tooth structure due to chemical dissolution by acids not of bacterial origin. Dental erosion is the most common chronic disease of children ages 5–17, although it is only relatively recently that it has been recognised as a dental health problem. There is generally widespread ignorance of the damaging effects of acid erosion; this is particularly the case with erosion due to fruit juices, because they tend to be seen as healthy. Erosion is found initially in the enamel and, if unchecked, may proceed to the underlying dentin. Frequently consumed foods and drinks below pH 5.0–5.7 may intitiate dental erosion. The most common cause of erosion is by acidic foods and drinks. 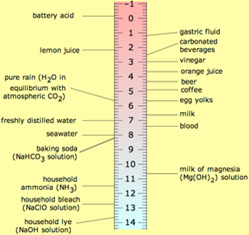 In general, foods and drinks with a pH below 5.0–5.7 have been known to trigger dental erosion effects. Numerous clinical and laboratory reports link erosion to excessive consumption of drinks. Those thought to pose a risk are soft drinks and fruit drinks, fruit juices such as orange juice (which contain citric acid) and carbonated drinks such as colas (in which the carbonic acid is not the cause of erosion, but citric and phosphoric acid). Additionally, wine has been shown to erode teeth, with the pH of wine as low as 3.0–3.8. Other possible sources of erosive acids are from exposure to chlorinated swimming pool water, and regurgitation of gastric acids. There are many signs of dental erosion, including changes in appearance and sensitivity. One of the physical changes can be the color of teeth. There are two different colors teeth may turn if dental erosion is occurring, the first being a change of color that usually happens on the cutting edge of the central incisors. This causes the cutting edge of the tooth to become transparent. A second sign is if the tooth has a yellowish tint. This occurs because the white enamel has eroded away to reveal the yellowish middle layer of the tooth called dentin. A change in shape of the teeth is also a sign of dental erosion. Teeth will begin to appear with a broad rounded concavity, and the gaps between teeth will become larger. There can be evidence of wear on surfaces of teeth not expected to be in contact with one another. If dental erosion occurs in children, a loss of enamel surface characteristics can occur. Amalgam restorations in the mouth may be clean and non-tarnished. Fillings may also appear to be rising out of the tooth, the appearance being caused when the tooth is eroded away leaving only the filling. The teeth may form divots on the chewing surfaces when dental erosion is occurring. This mainly happens on the first, second, and third molars. One of the most severe signs of dental erosion is cracking, where teeth begin to crack off and become coarse. Other signs include pain when eating hot, cold, or sweet foods. This pain is due to the enamel having been eroded away, exposing the sensitive dentin. Fluoride Fluoride can greatly help dental health by strengthening the tooth enamel, making it more resistant to tooth decay.